This colourful fellow just loves swimming around in the sea, searching for scallops in Animal Crossing: New Leaf. 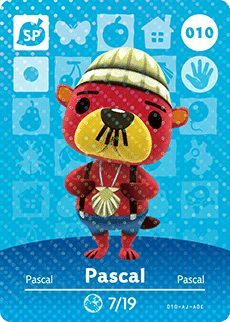 Slap on a wet suit to chat with Pascal, by diving to collect a scallop that he will trade a piece of rare furniture for. His birthday falls on July 19th, meaning that his star sign is Cancer.